Staverton can rightly claim to be the ‘high church’ of the 25 Daventry Deanery parishes, being situated 700 feet above sea level on one of the highest points of the Northamptonshire Heights . The 200 or so dwellings and 500 residents that make up this ancient village lie a couple of miles west of Daventry on the A425 – once the Daventry-Warwick turnpike. 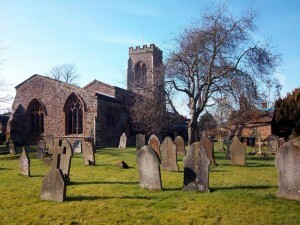 A place of Christian worship has stood on the site of St Mary’s for well over a thousand years although the name of Staverton’s first recorded vicar does not appear until records start in the year 1220. A board inside the Church lists all subsequent vicars up to our present incumbent, Reverend Roy Kilford. For hundreds of years before this, possibly dating back to before 800 A.D., a burial ground existed on the site, as evidenced by the raised churchyard. The main structure we see today dates mainly from the 14th Century, although traces of older architecture still remain such as a lancet window from the Norman period. The church houses an abundance of original architectural and historic features, and beautiful stained glass windows. The main structure we see today dates mainly from the 14th Century, although traces of older architecture still remain, such as the lancet window in the north-west corner which is from the Norman period. The ‘new’ North Porch is used as the main entrance into the Church. This dates back a mere 600 years, whereas the south porch is 100 years older! The original door and roof timbers still remain. A small army of people are dedicated to the ongoing maintenance and upkeep of St Mary’s. In summertime the churchyard is kept beautifully mown, neat and tidy, and attracts many admiring comments from passersby and visitors from all over the world. Inside church throughout the year flower displays are arranged and cleaning carried out by a team on volunteers on a weekly rota basis. Others are involved in administering the Stewardship campaign, organising and helping with the increasingly popular Family Services, and in many other ways, and this wealth of loving care and attention keeps the Church of St Mary at the heart of the village of Staverton. The monthly service of Family Communion on the first Sunday of each month is a popular event. At the rear of the church a ‘quiet corner’ has been developed where small children are able to play during services. Bell Ringing: The Church of St Mary the Virgin has a lovely peal of six bells. Recently Staverton Church of England Primary School initiated a unique scheme (which has attracted television coverage and attention from as far afield as Australia!) to incorporate campanology into the music studies curriculum. Regular bell ringing practice meetings, open to all ages, are held every Thursday evening from 7:00pm until 9:00pm. New ringers – learners or experienced – are always made welcome. Please contact the Vicar for further details.